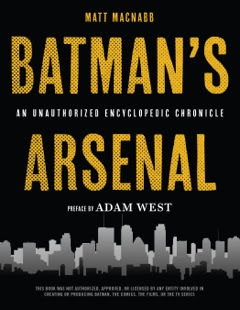 Review Fix chats with “Batman’s Arsenal” author Matt MacNabb, who breaks down his inspiration for the book and the exhaustive research that made the encyclopedia a reality. The super-comprehensive BATMAN’S ARSENAL: An Unauthorized Encyclopedic Chronicle, by MATT MACNABB, documents the entire scope and history of Batman’s incredible crime-fighting tools from the famous cowl, the awesome Batmobile, the catacomb-like Batcave to the tank-like Tumbler – the unique weapons Batman employs to keep Gotham safe. It is really his equipment and unique gizmos that not only define him but also transform him into a superhero. After all, he’s one of the very few superheroes who’s as human as the rest of us. Matt MacNabb: I own so many Batman “reference” books and picture books, DK Guides and such, but none of them do more than scratch the surface of Batman’s extensive 77-year history. I see a gap that needs to be filled and so I set out to write the most detailed and extensive Batman reference book ever written. One reader referred to it as “a college course on Batman”. Review Fix: What was the research process like? MacNabb: It was extremely labor intensive. I literally read through thousands of comic books and watched endless hours of cartoons and movies. I know, not exactly the worst job in the world, right? It is still, believe it or not, very hard work. The amount of data to organize can be overwhelming. Still, it was a labor of love, time well spent. Review Fix: Why is Batman still a fixture in pop culture? MacNabb: The themes expressed through Batman are timeless. Our need to create a harbinger of justice in a world where we are so often faced with injustice. A silent and thankless hero, incorruptible by the world, devoting his every day and night to bringing balance to a chaotic world. Plus, he’s awesome. Review Fix: What did you learn about Batman (that you didn’t already know) through your research? MacNabb: It was a humbling experience. I found that while I knew quite a bit, there is always so much still to learn. One interesting tidbit is how overstated Batman’s early association with guns was. There is always the talk about how Batman originally carried a gun and shot criminals, and yet there is no evidence of Batman killing anyone, save a run-in with a vampire. In fact, he never carried around a gun at all. He did, on the other side of that coin, kill criminals…a lot. He just didn’t use a gun. Review Fix: What was it like to work with Adam West on this? MacNabb: Adam West is an absolute gentleman. When I started my website back in 2003 he was my first big interview. It was gracious of him to do that back then and it was more than gracious for him to take the time out of his life to contribute to my first book. It was an honor. Review Fix: Batman has continued to adapt through the years. Which era of the Caped Crusader is your favorite and why? MacNabb: That’s such a hard question, I love it all in different ways. I tend to gravitate towards the Batman of the 1980s and 1990s. The era of the Knightfall saga and No Man’s Land comic book arcs still resonates for me, as well as Batman: The Animated Series and Batman Beyond. I was a teenager during that time, so I think a lot of that sticks with me as nostalgia. Review Fix: What would you like readers to get out of this book? MacNabb: My sincere hope is that everyone that picks up this book will learn something new and maybe surprising about Batman. There is so much misinformation that goes around online, much of which I was able to debunk with first-hand research. I hope this book can serve as a great reference for the fans. MacNabb: I have a new book coming out this June, Ghostbusters Collectables, that showcases 30 years of Ghostbusters toys. I’ll also be working with Opus to produce a few more Batman non-fiction titles in the coming years.